This download contains three lessons from a cumulative unit. the first lesson is on measurement, the second lesson is on the golden ratio, and the third lesson is on scale and contains a map activity. These lessons are not to be used day after day, but are part of a unit that should be spread out. 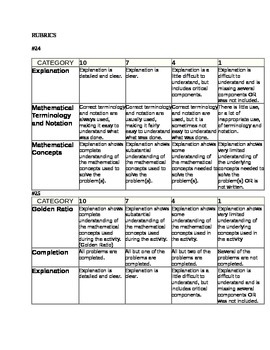 This unit explores the concepts of proportional reasoning, ratio, and indirect measurement. Students engage in a variety of activities that involve taking their own measurements, exploring different ratios, and examining similar figures. Students convert measurements into Standard and Metric Units. These activities immerse students in problem solving, reasoning, and making connections to real life situations. 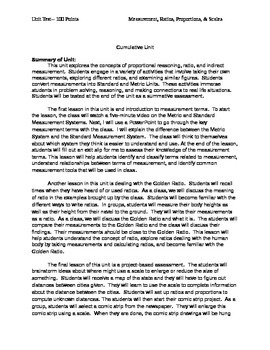 Students will be tested at the end of the unit as a summative assessment. 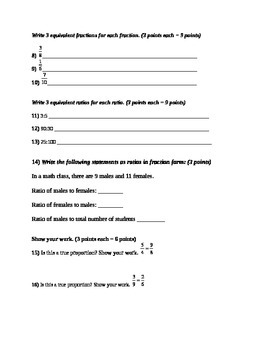 The summative assessment (test) is included in this download. It is 25 questions with 6 fill in the blank, a categorizing question, 6 questions dealing with equivalent fractions, 9 show your work problems, and 2 essays for a total of 100 points. - M.1.A. 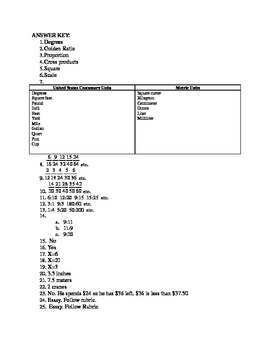 Select appropriate units to measure angles, circumference, surface area, mass and volume, using U.S. customary units; e.g., degrees, square feet, pounds, and other units as appropriate; metric units; e.g., square meters, kilograms, and other units. - 7.RP.1. Compute unit rates associated with ratios of fractions, including ratios of lengths, areas, and other quantities measured in like of different units. - 7.RP.2. Recognize and represent proportional relationships between quantities. - G.7.1. Solve problems involving scale drawings of geometric figures, including computing actual lengths and areas from a scale drawing and reproducing a scale drawing at a different scale.